Gwen Marston and Freddy Moran are BOTH going to be in Sisters Oregon for a whole week in July! Teaching classes like Little House in the Big Woods, Liberated Wedding Ring, Freddy Dot Com.....all Freddy's. And then on top of that.... Liberated Log Cabin, Liberated String Baskets, New Quilts in Solids, and Liberated Stars....all by Gwen, they will also be featured at a large group lecture and picnic to cap out their busy week before the Sisters Outdoor Quilt Show officially opens on Saturday, July 11, 2009. In total, Gwen and Freddy are teaching 10 classes in the Sisters Outdoor Quilt Show's week long series of classes known as the Quilter's Affaire amongst a wonderful array of other classes, lectures, workshops, a play and a garden tour that makes up this amazing week long event. I live in Oregon, and I have friends who not only grew up in Sisters....but now live in Camp Sherman. So, I have room and board...and I signed up for for Gwen and Freddy's classes...and their classes' alternates.....and I still couldn't get into a single one of either of their workshops! I'd heard that classes fill up quickly and that the competition was fierce. Cher of Marathon Quilter in Portland was even told at Sisters Outdoor Quilt Show last summer to get on their mailing list of year long classes for early notification. Both of us signed up as soon as we were notified...and neither of us got in. I'm beginning to wonder if quilters fly over to Sisters, camp out, and are sleeping on the sidewalk when The Stitchin' Post opens....to hand deliver their forms....because how else does one get a spot in one of the classes? But, luckily...there is a rainbow at the end of our storm cloud. We did get into their More Collaborative Quilting lecture and picnic on the grass at the Village Green Park on Friday night. 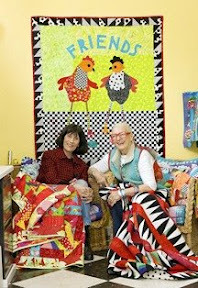 Showcasing and debuting their brand new book Freddy and Gwen Collaborate Again (out in July 2009) and with new quilts, new stories, and fresh ideas...well it just might make me feel better. We were told that while the lecture in the park is free, it's much better to buy the box lunch and get first seating right in front of the stage to see Gwen and Freddy up close and personal. If you just go in for the lecture alone, you are seated later and have to sit on the sides of the stage. That and my picnic lunch of "Buttermilk Fried Chicken Breast, Tropical Confetti Coleslaw with Mango & Pineapple, Watermelon Wedge, Sourdough Sweet Roll and Butter and of course, the Dessert Plate with Assorted Treats just might make me feel better about losing out on their classes! However, by registering for classes I didn't get into, my $20 non-refundable deposit is now added to my picnic lunch tab of $16.95. A box lunch for $36.95? Ugh! Hope you really ENJOY that boxed lunch for that price! Seriously, hope you have a great time. It all looks very interesting. I can see why those classes are popular, and I'm glad you are managing to get to attend the lecture at least and see the latest and greatest. I certainly hope the fee is only nonrefundable if you decide not to go, not if the class is full. That isn't fair at all, and seems suspicious to me if they sold out of the classes so quickly. But at least you'll going to have fun...that is what counts right. Disappointing that you couldn't get into the class but the lecture/lunch sounds great even at the cost! My copy of the book has been long-pre-ordered through Amazon.com ~ sorry the classes were already full but I'm guessing the lecture/picnic will be a blast! oh, but it's going to be suuuch a great lecture, you will have a total blast. I love Freddy and Gwen's first book- it makes me feel so happy looking at all the beautiful colors in it. It is too bad that you are not going to get into their classes- I am sure the lecture will be fun - too bad about the cost. I am sure it will be worth it though. Just goes to show how popular both of them have become over the last few years. I'm sure the lecture will be great fun and you'll have a blast, despite the cost. I'm still laughing over the last post-although it explains nearly everything clearly! I'm so excited about their new book coming out. It just makes you feel happy to look at the current one. They've made me utter words that were not in my vocabulary before such as "why not?" Love the liberated attitude.